teko96 has no other items for sale. Shipped fast and is a good product . Fast shipping and got exactly what I ordered. Doesnt fit an IPHONE 6+ but ill find a use for it. Thanks. This adapter works like magic! I usually do not write reviews on products, but this one has been an exceptionally useful product that I decided to leave an interesting review on it. I'm a micro-surgeon working on microscope all the time. The equipment that you need to record the operation in real time are usually thousands of dollars, and we were looking for cheaper options and decided to give this a try.....and we are just astounished by the results. It's sturdy and has a good grip on the cell phone and works with any cell phone (even big ones!). Finding the correct spot for the cellphone on the scope lens needs some practice but other than that, this product does what a thousand dollar recorder does. I recommend this to everyone. UNIT QUALITY IS GOOD, BUT, BEWARE - AS ADVERTISED USAGE ON A RIFLE IS IS OUTRIGHT MISLEADING, AS FOLLOWS: WORKS WELL ON BINOCULARS, SPOTTING SCOPES, TELESCOPES, WHERE EYE IS CLOSE TO EYEPIECE, BUT, WILL NOT WORK ON ANY RIFLE, BECAUSE, THE EYE RELIEF NEEDED TO PROTECT THE EYE FROM RECOIL, IS NOT BUILT INTO THE BRACKET. THE BRACKET IS TWO DIMENSIONAL, TO BE USED ON A RIFLE, THE BRACKET WOULD NEED TO BE THREE DIMENSIONAL. 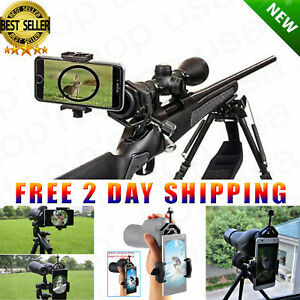 IT SIMPLY IS MISSING A BRACKET MEMBER, TO PROPERLY POISITION A SMARTPHONE CAMERA, FOR RIFLE USE AND EVEN IF IT HAD THIS BRACKET - YOU WOULD ONLY SEE A SMALL CIRCLE SIZED PICTURE OF WHAT THE SCOPE VIEWS - NOT A FULL SCREEN PICTURE AS SHOWN IN ADVERTISEMENT, UNLESS, IT HAD A ZOOM FEATURE, WITH MACRO CLOSE-UP FOCUS.